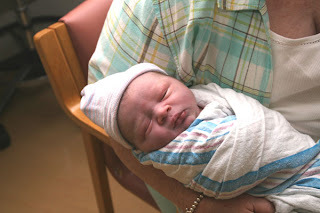 This is our newest Great-Grandson, born Sunday September 28 at 7:00 p.m. on the dot. Dylan Jon weighted 9 pounds 1 oz and is 21 inches long. He is a big baby and so beautifully filled out. He has the prettiest long fingers and finger nails and that just amazes me. As I held him, I knew I had just witnessed a miracle. Mother and baby are doing great. Our granddaughter Kara is so amazing. She does not take one drug or pain medication and never utters a peep during the entire birth process. This is her fourth baby and she has done the same with all of them. Because of his size though, this was harder for her than any of the other babies. My hubby is so pleased that he carries his name Jon. We welcome Dylan Jon to our family and we are so thankful that we get to enjoy our Great-Grandchildren. Oh my He is just precious!! And don't you look HAPPY!!! Huge Congrats to all!!! What a beautiful baby!!! congrats to you and welcome to dylan! lovely photos! joan...i did 3 babies w/out meds but i don't recall QUIET! :) CONGRATS to kara too!